Pandum online is a MMORPG where players evolve in a dark fantasy universe plunged into chaos by divinities. Skills and statistics can be freely assigned, allowing to build custom character classes. This game owns all classical elements of an RPG, such mounts, pets, equipment which can be enhanced and craft. 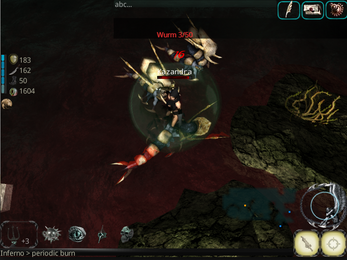 Players can team up to achieve quests or fight themselves every where in the open world (except in trade zone where characters can open shop that will remains after disconnection). Some alternative game play are also present such a battle arena and a card game in a tavern. Arcadified game play : no windows for skills, inventory ..., everything is done from a single browsable action bar. Dungeons are small with some platform oriented sequences. Right click/Enter key to attack or dash if you are far from an enemy, this will consume stamina (orange bar on left of screen). Base attack damages depends on the stamina level. stamina (orange bar on left of screen). Base attack damages depends on the stamina level.